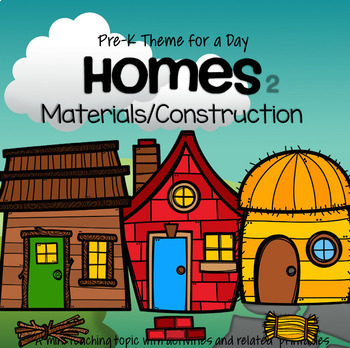 The teaching theme focus for this packet is homes and houses, with the emphasis on the materials used in building homes, and their construction. This is second of 3 units about Homes. • Set of flashcards of houses around the world made of different materials – make a matching game. •	Sorting/categorizing activity – sort pictures of things made from metal, plastic and wood onto mats. Let the children see and touch some real items made from these materials before attempting the activity. •	The Three Pigs storytelling characters. Use for flannel and magnetic boards, stick puppets, dramatic play etc. •	Construction worker number cards 0-10 – match sets of tools with the numbers. 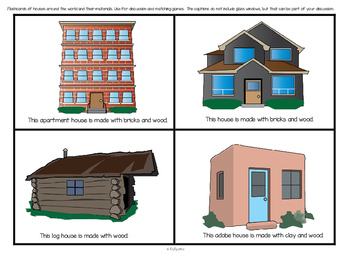 •	House building words and pictures strips word wall. - Song printable - sing, discuss and color - "What color is your house?" 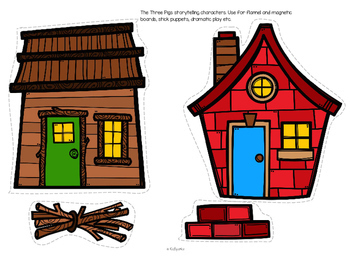 - Create a collage with cut out houses, fences and trees. - Set of flashcards picturing textures of building materials. - Discuss and draw: “This is my house. I think it is made out of _________”. This product is also available as part of a MEGA curriculum collection bundle for the month of November NOVEMBER Themes Collection Bundle - Pre-K Theme for a Day at a significant discount.